A pair of Resident Evil 4 fans are working to improve the graphics of 2014’s “Ultimate HD Edition” on PC, and the results are pretty dramatic. Called the “RE4 HD Project,” the mod is cleaning up the game’s textures and producing some very pretty screenshots. 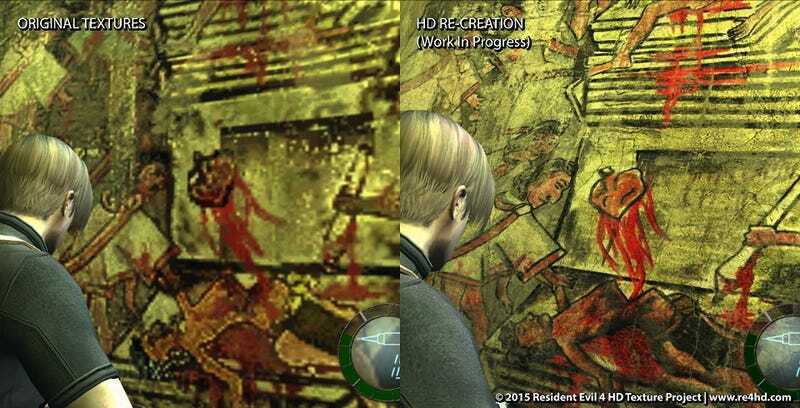 The differences between Capcom’s definition of HD and those of Cris and Albert, the two modders working on new textures for RE4, are stark. And kind of ridiculous, actually. Side-eyeing in your direction, Capcom. At present, it looks like the project is about 50 percent complete, but an HD texture pack for the Village section of the game is already available at re4hd.com. Scope some screens of the improvements below. Phil Hornshaw is a freelance journalist and co-author of So You Created a Wormhole: The Time Traveler’s Guide to Time Travel and The Space Hero’s Guide to Glory. You can follow him on Twitter at @philhornshaw or contact him at philhornshaw@gmail.com.